Ackee and saltfish, the national dish of Jamaica, is a delicious and popular breakfast food. Often accompanied by green banana and fried dumplings, this hearty meal will keep you going long beyond lunchtime. Cooked ackee looks much like scrambled eggs and has a similar consistency. It can be quite bland, which probably explains why it isn’t eaten alone. Saltfish is the perfect accompaniment, dried and salted, it must be soaked before preparation. The exciting thing about ackee is that it can be fatal if not properly prepared – the fruit must open naturally, and only the yellow part be eaten. Culture Trip explores the best places in Kingston to enjoy Jamaica’s national dish ackee and saltfish. Ziggy’s breakfast menu offers a great start to the day for many Kingstonians in the Manor Park area. Ackee and saltfish is served up daily and there’s a pleasing variation of this national dish available which includes cabbage and saltfish, and red herring and saltfish. Ziggy’s has a catering service and also delivers takeaways, so there’s no excuse for not getting that daily ackee and saltfish fix. 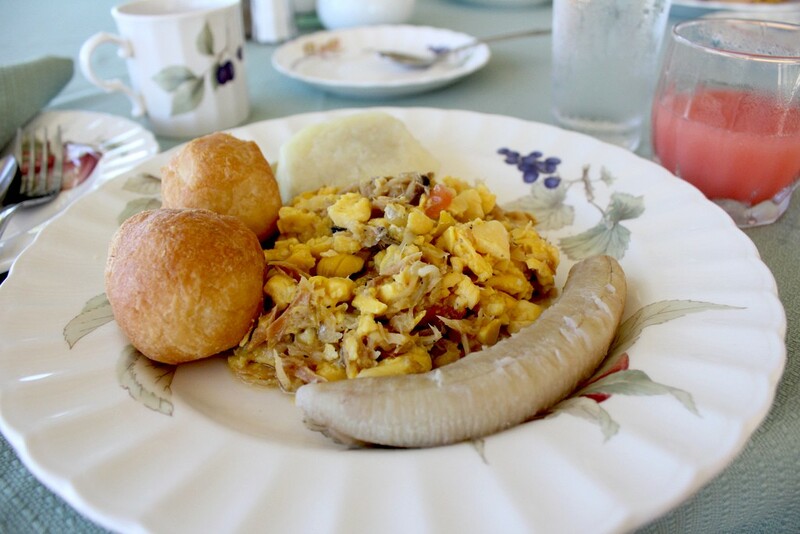 Ackee and saltfish is a daily fixture at Susie’s and not just for breakfast – it’s on their lunch menu too. Small plates are a bargain at $1000JD and come with an assortment of sides including callaloo, bammy, boiled dumpling and green banana. Jazz things up a bit and try it with a side of pancakes and maple syrup or with some crispy fried chicken for lunch. For the traditionalists there’s also boiled yam and dumplings on offer. Susie’s is a Kingston institution and always buzzing with a lively crowd. Situated not far from one of Kingston’s busiest and most chaotic bus terminals, Pot Pon Fyah is popular with commuters who need more than a pattie to get them started. The daily ackee and saltfish is a filling treat for the hungry. Delicate flakes of saltfish are combined with perfectly cooked ackee at one of the best-value options in Kingston. In a true merging of the traditional and the modern, Pot Pon Fyah accepts orders by WhatsApp and delivers it to your desk. Serving up home-cooked Jamaican food is what Sonia’s does best. There’s no need to wait until the weekend for ackee and saltfish as it’s served daily here. Try it with a fresh cane or soursop juice: what better start to a Jamaican day? Sonia’s is known for their brunch and also for their special Jamaican Sunday lunch, so why not save this one for the weekend. This casual Kingston hangout serves a regular breakfast of ackee and saltfish with delicious sides of boiled breadfruit, plantain, yam and callaloo. Situated in the Altamont hotel in New Kingston, this restaurant serves authentic homestyle food. Popular with locals, Hot Pot is easy to reach from the tourist hotels in New Kingston, providing a convenient opportunity to sample Jamaican home cooking. There’s more on offer here than just patties. The ever popular and affordable ackee and saltfish combo includes boiled dumplings, fried dumplings, green banana and comes with a free coffee or juice. In a hurry? Don’t worry about endless breakfast queues either, because this branch of Tastee has a drive-thru. This is the fast-food option for those in a rush who don’t want to give up their authentic Jamaican dishes.